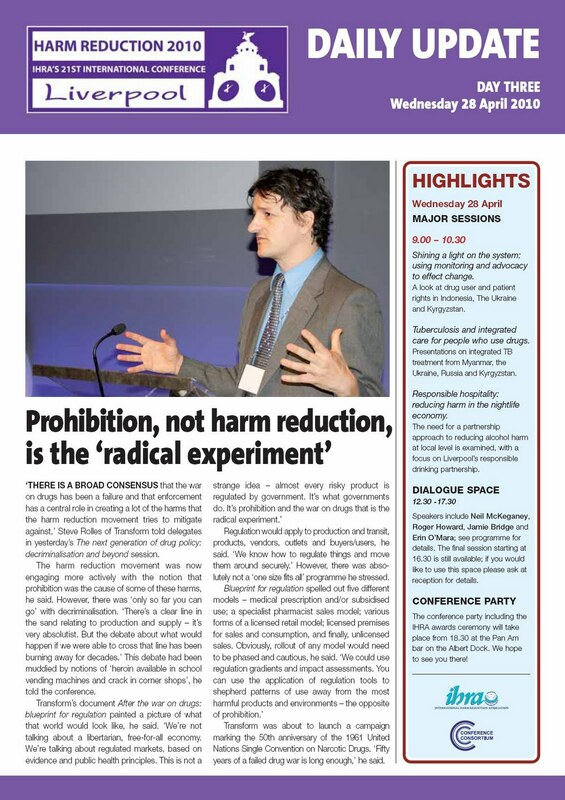 Transform, in collaboration with the International Drug Policy Consortium organised the Tuesday plenary session at this year's International Harm Reduction conference in Liverpool, titled 'The Next Generation of Drug Policy: Decriminalisation and Beyond'. The Session was chaired by John Ashton, and the presentation abstracts are copied below (full program available here in pdf). 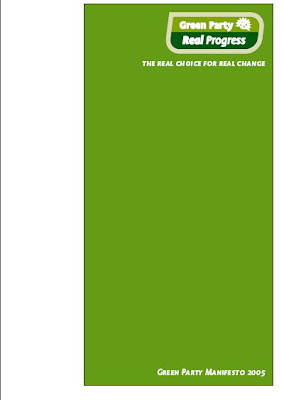 Transform's contribution made the front cover of today's conference report (see below), with Alex Steven's presentation on Portuguese decriminalisation also covered on page 6. When the video of the session is available online we will add a link here. Argentina, like all the other Latin American countries, has adhered to the 1961, 1971 and 1988 United Nations Conventions on drugs and the subsequent laws that have been passed reflect this by penalising possession of drugs for personal use and imposing heavy penalties for drug trafficking and even micro-traffic. This enforcement- focused approach to drug control has placed a heavy burden on the judicial system and the high incarceration rates for drug-related offences have led to prison overcrowding. To address the negative consequences of prohibition, many countries in Latin America have enacted a series of laws to discriminalise the possession of small quantities of drugs for personal use: Brazil (2006), Chile (2005), Paraguay (1988), Uruguay (1998), Mexico (2009). Argentina’s and Colombia’s Supreme Courts have recently followed suit in the cases of “Arriola” and “Bastidas” 2009, respectively. The Argentinian goverment’s decision, translated at an international level into the United Nations (51st session, March 2008), advocating a paradigm shift in drug policy towards greater emphasis on access to the health care and respect for the drug user’s dignity and basic human rights. At a national level the shift led to the establishment of the Scientific Advisory Committee on Drugs, aimed at developing drug-related programmes from a public health perspective, and pursuing reform of domestic and international drug control systems in line with the international conventions on human rights. The committee’s calls for reform highlighted the need to ensure access to health care as the central focus of any drug policy, as well as critiquing the failure of the current drug policy on supply control and demand reduction indicators. This critique demonstrated in particular the futility of enforcement efforts which disproportionately focused on low-level users and small-scale dealers. Originally to be presented by Ann Fordham from IDPC, who was unable to attend because of the volcano flight disruption. Almost all nations are currently members of the global drug prohibition regime. This operates via a UN-based treaty system comprising a suite of three international drug control conventions: the 1961 Single Convention on Narcotic Drugs (as amended by the 1972 Protocol), the 1971 Convention on Psychotropic Substances and the 1988 Convention against Illicit Traffic in Narcotic Drugs and Psychotropic Substances. The bedrock of the regime is the Single Convention. This contains a general obligation for signatory nations, subject to the provisions of the convention, to limit exclusively to medical and scientific purposes the production, manufacture, export, import, distribution of, trade in, use and possession of drugs. Although the prohibitionist ethos of the regime is beyond doubt, the conventions nonetheless contain a certain degree of flexibility. This presentation explores the various legal mechanisms behind such “wiggle room” and outlines how a growing number of parties to the conventions have engaged in “soft defection” from the regime’s prohibitive expectancy; a process involving interpretative strategies that keep national policies within the confines of the letter, if not the spirit, of the international legal framework. Despite such grey areas, latitude is by no means unlimited, however. Indeed, it will be shown how, in expanding domestic policy space, many states are now at the limits of what is legally permissible within the extant regime. The presentation will also show how, while the conventions permit a degree of policy flexibility in terms of possession for personal use, there is no such scope for production and supply. This is a particularly acute point of tension as more jurisdictions adopt tolerant approaches to dealing with the recreational use of cannabis. Originally to be presented by Fatima Trigueiros from the Institute for Drugs and Drug Addiction, Portugal, who was unable to attend because of the volcano flight disruption. In 1999, the Portuguese government approved the first national strategy on drugs, a historic turning point for drug policy. One of the measures proposed by the strategy was the decriminalisation of consumption and possession of all illicit drugs for personal use (defined as a quantity that must not exceed that needed for average individual consumption over ten days). In 2001, this was made law in Portugal. This new law meant that personal consumption and possession would no longer be considered a crime, but would constitute an administrative offence – therefore no longer carrying a penalty of imprisonment. The main purpose of this law was to prevent and reduce drug use and to promote and protect the health and social well-being of people who use drugs and encourage them to enter treatment. Eight years later, all the available evidence and indicators suggest that the overall impact of this law has been positive – although a direct link between these results and decriminalisation cannot be assumed. Decriminalisation is one element of a comprehensive national strategy aimed at preventing drug use, facilitating access to counselling and treatment, and establishing effective measures to reduce the adverse health and social consequences of drug use. There have been some problems and challenges in implementing the law and we intend to propose some adjustments to it in the near future, based on past experiences. The INCB orginally accused Portugal of disrespecting the UN conventions on drug control but – after two missions to Portugal – they now recognise some of the benefits of Portuguese law. The 2009 World Drug Report noted that “Portugal’s decriminalisation of drug usage in 2001 falls within the Convention parameter”. The2009 Annual Report of the EMCDDA has also recognised that decriminalisation has not led to an increase in drug use or drug tourism in Portugal. This presentation explores what an evidence-based drug policy, based on public health and harm reduction principles, might look like if freed from the constraints of existing absolutist prohibitions on drug production, availability and use specified by the UN drug conventions. 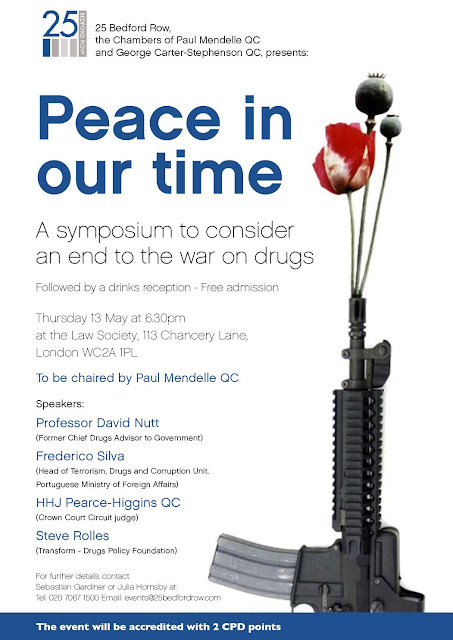 In a post-drug-war world how might legal regulation and control of drug markets function? What would the appropriate models be for different drugs? How could they be developed and implemented? It will be argued that legal regulation of drug markets – finding the optimum point between the extreme poles of absolute prohibition and unregulated legal commercial activity – is the rational continuation of a broader harm reduction approach; one that considers the origins of drug harms in macro policy environments, specifically the punitive enforcement approaches. The menu of possible regulatory options for drug markets will be reviewed in summary, including potential legal controls over products, outlets, vendors, availability, premises and using environments, and purchasers, to consider how to control availability in ways that deliver the best outcomes both for users and wider society. It will be proposed that different drugs, depending on product risk assessments and local environments, could be made available either through medical prescription models, a specialist pharmacist model, various forms of licensed sales or licensed premises, or unlicensed sales. More risky drugs would be less available, less risky drugs relatively more available, thus in the longer term progressively shepherding patterns of use towards safer drugs, preparations, behaviours and environments, in direct contrast to the harm maximising impacts of illicit drug markets. Implementation would be phased over a number of years and supported by rigorous monitoring and evaluation. This presentation aims to broaden the harm reduction debate by providing a foundation for discussing legal drug regulation as a practical option for the next generation of drug policy development. Back in February This blog reported on an interesting page stumbled across on the UN Office of Drugs and Crime's website Youthnet pages. Coming from one of the bastions of prohibition this was an almost alarmingly sensible page about cannabis use, risks and laws. The section on laws was particularly striking as it was an unambiguous critique of the failed enforcement approach to managing cannabis risks, and made a rational and eloquent argument for the decriminalisation of the possession and use of cannabis. Disappointingly, just two days after we blogged about it, the entire section on cannabis law reform disappeared from the page, despite having sat unbothered (and, one assumes, unread) since 2007 (the deletion blogged here). This seemed a little churlish in light of the fact that numerous member states have already adopted the approaches suggested in the text, for the very reasons it outlined so clearly - indeed Canada is given as a case study. Somewhere within the UNODC machinary a different - more hard-line old-school prohibtionist view clearly held sway, one that is curiously intolerant of any dissent from the most punitive interpretations of the conventions. They made sure the offending passage was removed, in effect, censored. Even this was rather fumbled, with a reference to the now deleted section four on cannabis laws remaining in the opening paragraph, until it was spotted by a Transform blog commenter, at which point it too disappeared the following day. Now, however, the contentious section four on cannabis laws has reappeared but, in a rather troubling development, it bears no resemblance to its previous incarnation. In a rather audacious bit of textual revisionism, all discussion of the merits of decriminalisation have been excised (references, authors, and all), with a call for proportionality in sentencing and alternatives to custody, the only vague nods in the direction of reform. Instead we now have an INCB-style argument for maintaining the criminal status of users, along with some stern warnings about the 'multiple negative health and social consequences' of cannabis use (that notably doesn't sit easily, in its tone or content, with the more measured risk analysis in the preceding three sections). Calls to UNODC have failed to produce an account of why the decision was made (any explanation would still be welcome). In many respects this episode is somewhat trivial, but it does point to something more important.What are they so concerned about that they should feel the need to resort to this sort of censorship and revisionism? It certainly isn't the Transform blog, so one can only assume it is born of a more fundamental concern. Decriminalisation, despite the fact that it is happening across the world, from the US and Canada, South and Central America, Australia, Israel, and much of mainland Europe, is a direct challenge to the fundamental punitive tenets of prohibition, at least in the quasi-religious formulation of some key hardline voices. For them, evidently, this means that dissent (even rational discussion or evaluations of alternative approaches) is a heresy that must be stifled. And if that means rather lame Orwellian rewriting of obscure pages of official websites, so be it. The revised text follows, but first here is the original text of section 4 'The effect of the cannabis laws' as it read before we blogged about it. The text considered too dangerous for delicate UNODC web readers (that didn't make the revised version) is highlighted in red. A criminal record labels a person caught with possessing small amounts of cannabis as a criminal and severely limits their ability to find employment, professional certification and to travel to other countries. Criminalizing a behaviour has a number of effects: it may make it more attractive to some youth, and it may result in the further marginalization of some youth, making it more difficult to help them. Cannabis use (particularly heavy use in combination with other substances) poses risks, so it is important that any change not result in increased use. Based on the experiences of those countries or states that have reduced their penalties, various reviews agree that there is no indication that this will happen. For example, the 11 US states that decriminalized marijuana possession in the 1970s did not see increases in use beyond that experienced by other states; neither did the Australian states that have introduced a civil offence model over the past decade. Over the past 10 years in most Western countries, the use of cannabis by young people has increased and attitudes have generally grown more tolerant toward the drug, with no difference between countries that had stiff or reduced penalties. For example in the Netherlands, where cannabis use is not a criminal offence, usage rates are lower than in the US, which has some of the toughest cannabis laws in the Western world. Young people who do not use cannabis generally say that their decision is based on health concerns or that they are just not interested. They aren't as likely to mention the laws as being a factor in their decision. In fact, research with teenage students suggests that the criminalization of cannabis and the stigmatization of cannabis use as a dangerous and forbidden activity makes it even more attractive to some. Cannabis offences can take one or two officers off the street for up to several hours + their time for court appearances + tying up other court resources. These $ could have more impact put into apprehending producers and traffickers, or directed at prevention, education and treatment. Although the law is an important means of controlling behaviour, accurate and balanced information and education should be seen as the primary means to enable young people to make informed choices about their drug use. For example, laws cannot distinguish between levels of use, whereas educators can help young people by providing clearer messages (for example, all drug use contains some risk - heavy use can result in serious problems for young people, while light, infrequent cannabis use poses fewer risks). In Canada police are often reluctant to apply the penalties for possessing small amounts of cannabis, not only because of the work involved, but also because they do not want to saddle a young person with a criminal record. When a young person is found in possession of small amounts of cannabis in Canada, the typical police response is some combination of taking the drug, detaining the person in the police car or station, giving them a warning and letting them go. As a result, young people feel that the police do not take the laws very seriously; some also feel that they are applied unevenly depending on a person's ethnicity, the clothing they are wearing, etc. One of the options being considered is to give the person a ticket, like a traffic ticket. Even though this would seem like a softer approach, it would in fact represent a greater penalty than many young people currently experience. And if the police "widen the net" (that is, become more active in apprehending youth) as apparently occurred in Australia when penalties were reduced, it would actually mean that young people would be more likely to be penalized. Another possible outcome is that parents are more likely to be involved when their child is fined than if they are just "slapped on the wrist" and let go, providing an opportunity for parent/child discussion on the issue. Also, creating a reduced penalty option reduces the deviance attached to the behaviour, which does lead to a climate more open to actual health promotion messages (e.g., that using around driving and sexual situations, or using to the point of intoxication, or using in combination with other substances or medications, or while involved in physical or cognitive activity can be harmful). Fischer, B, Albanes, R, and Amitay, O. "Marijuana, Juveniles and the Police: What high school students believe about detection and enforcement", Canadian Journal of Criminology, Vol 40(4): 401-420, 1998. A number of countries are debating their marijuana laws, in some cases deciding to transform the penalties from criminal to administrative charges or to commute criminal justice sanctions in education or treatment interventions. The possession, cultivation and purchase of cannabis are criminal offences in the provisions of the International Treaties. Currently, the international community treats cannabis as a serious drug, in the category "Schedule I," since its use is associated with multiple negative health and social consequences. Cannabis use poses serious health risks, particularly for young people, affecting especially psychosocial development and mental health. In addition, cannabis has been found to be involved in other increased risk, such as for lung cancer or car accidents. Keeping cannabis illegal can have the effect of reducing use, since availability, access, advertising, and promotion (unlike alcohol or tobacco) are restricted in a control system. Although cannabis remains illicit and should not be underestimated with respect to its risks for health and behavioural disorders, we also understand that overly harsh sentences for cannabis users can be counterproductive. To this purpose, the Conventions repeatedly underline the need for early identification, treatment, education, after-care, rehabilitation and social reintegration for drug users. Article 38 of the Single Convention (1961) states that "the Parties shall give special attention to and take all practicable measures for the prevention of abuse of drugs and for the early identification, treatment, education, after-care, rehabilitation and social reintegration of the persons involved", underlining the crucial role of health and social interventions. Moreover, Article 36 b states that "abusers shall undergo measures of treatment, education, after-care, rehabilitation and social reintegration". In its 2007 report, the International Narcotics Control Board 2007 (EN/INCB/2007/1), when discussing the principle of proportionality highlighting that "with offences involving the possession, purchase or cultivation of illicit drugs for the offender's personal use, the measures can be applied as complete alternatives to conviction and punishment". While the possession, cultivation and purchase of illicit drugs remain offences, drug users and drug dependent people should be offered education, treatment, and/or innovative criminal justice interventions (such as drug courts, or swift and certain sanctions) when appropriate, as alternatives to incarceration. Hall W, Degenhardt L (2009), Adverse health effects of non-medical cannabis use, Lancet, 2009 Oct 17, 374(9698), 1383-91. Gerra G, Zaimovic A, Gerra ML, Ciccocioppo R, Cippitelli A, Serpelloni G, Somaini L (2010), "Pharmacology and toxicology of cannabis derivatives and endocannabinoid agonists", Recent Pat CNS Drug Discov, 2010 Jan, 5(1):46-52. An important new report by Claire Cole, Lisa Jones, Jim McVeigh, Andrew Kicman, Qutub Syed & Mark A. Bellis was published yesterday by the Center for Public Health at John Moores University. 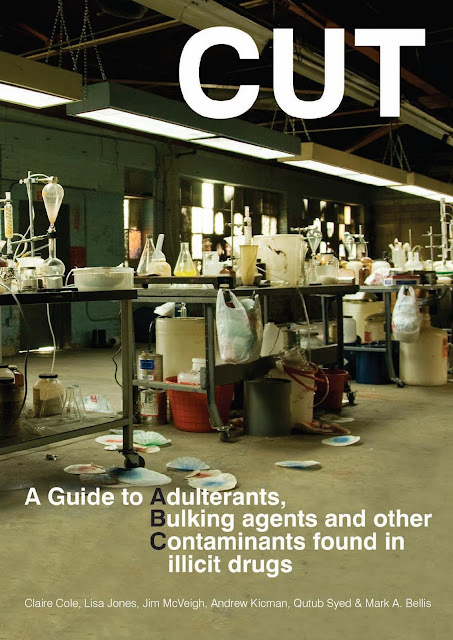 Titled 'A Guide to the Adulterants, Bulking agents and other Contaminants found in illicit drugs' (pdf) the report answers the question 'What else are people eating, snorting and injecting when they take illegal drugs? ', and offers a detailed review of the available evidence on drug contaminants, making a series of pragmatic recommendations on how related harms can be minimised. Whilst demonstrating that most adulterants are benign, it also highlights that others present a range of serious risks, including death. The seriousness of these risks has most recently been demonstrated by the anthrax contaminated heroin issue, and there is a useful section on the frequently ignored issue bacterial contaminants. 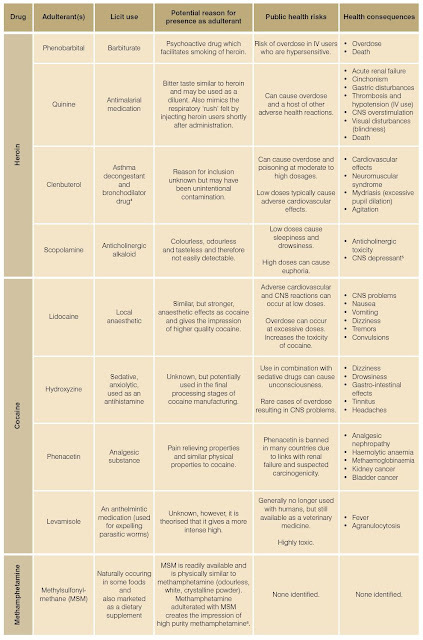 The summary table of drugs and adulterants is copied below in three parts (click image to see full size). Transform has covered a number of these issues in the past including the appearance of lead as a bulking agent in cannabis. If there is one shortcoming in the report is its failure to state that these issues are unambiguously and entirely the fault of prohibition and the illicit production and supply infrastructure it has created. 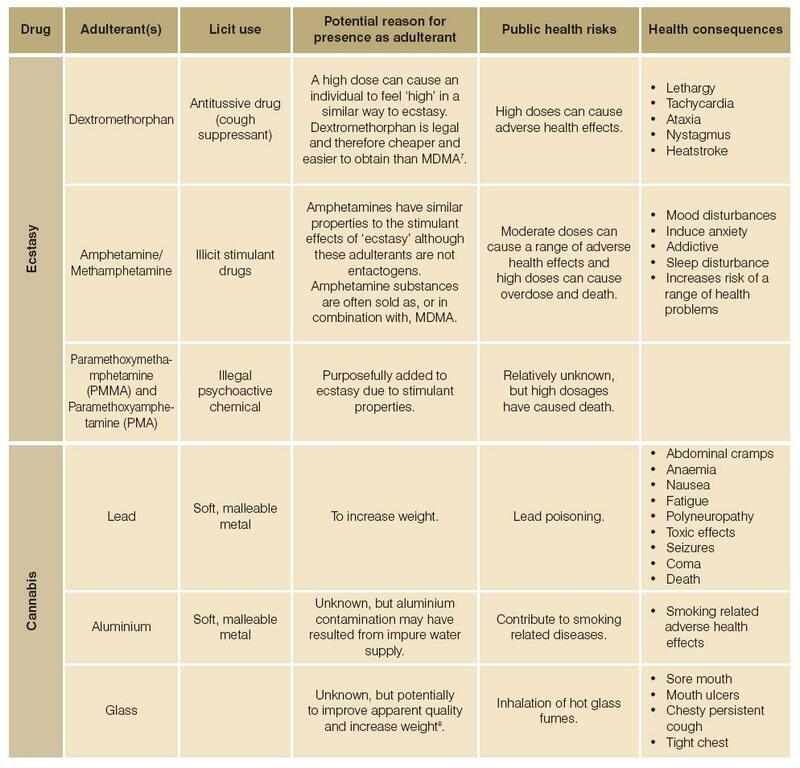 Instances of contaminants in licensed medical drugs (the counterfeit issue mentioned briefly on page 45), or alcohol and tobacco are very rare - and when they do occasionally occur, authorities are able to rapidly respond and immediately remove products from the market, in ways obviously impossible with an unregulated criminal trade. The recommendations in the report - whilst obviously pragmatic and sensible - limit themselves to symptomatic responses within the existing legal and policy framework. They only consider how to reduce the harms created by prohibition rather than exploring the possibilities for legal regulated supply that would eliminate the problems outright. This shortcoming is particularly notable regarding opiate injecting where advice is limited to making users aware of risks and educating about safe injecting. Given that legal opiate prescription models for injectors already exist, are legal, and are obviously not associated with any of the problems the report describes, its unclear why they do not feature in the recommendations, even as a discussion point. None the less, the authors should be congratulated on an important (if long overdue) piece of scholarship. It remains for others in the drug field to consider and act on its implications regarding longer term reforms that might deal with the cause of the problem, rather than just the symptoms. We are also taking action to improve health, prevent ill-health and tackle health inequalities. We are acting to tackle obesity and promote physical activity. We are also acting to tackle the health impact of tobacco, with legislation to restrict cigarette displays and remove vending machines. and we are investing more than ever in rehabilitation so that drug addicts can kick the habit. We want to reduce the damage that drugs do to the individual and to society as a whole. But words are not enough; real action is required. We will take firm action against drug dealers but we will also tackle the poverty and exclusion that contribute to the high levels of damaging drug use in some of our communities. We will also do more to help those who want to come off drugs. Long waiting lists for places on rehabilitation programmes make it much more difficult to tackle the problems drugs cause in our communities. That is why we would give people trapped by the misery of drug addiction access to rehabilitation facilities within 3 months. We would also introduce a programme of financial assistance for community-based groups to provide aftersupport to reduce the risk of relapse, and practical help and support for the families of recovering addicts. We also recognise the damage that alcohol misuse can do to the health and well-being of individuals,and society, and would offer more practical support to help tackle this problem. "We also oppose the privatisation of back-to-work services and the compulsory drug testing of claimants." "We call for a national community safety strategy for Wales, more drug rehabilitation places and programmes, drug and alcohol education in every school in Wales and better amenities for young people in their communities. We call for a minimum price per unit of alcohol, initially set at 50p, along with stricter controls on alcohol advertising and marketing." "Plaid Cymru calls for an immediate Military Well-Being Act to promote and safeguard the physical and mental health and wellbeing of military personnel. This includes ongoing after-care, legal advice and counselling support for veterans and their families, as well as improved compensation, housing, healthcare and treatment for alcohol and drug abuse." We need to tackle the causes of ill-health. These include not only long-standing causes such as poverty and unhealthy working and housing conditions, but increasingly also the misuse of drugs, lack of exercise, and exploitative marketing to young children. "We will press for greatly expanded provision of treatment, counselling, and rehabilitation for people suffering from drug addiction"
UKIP's Nigel Farage vocally supported drug decriminalisation on BBC's Question Time recently, but the UKIP 2010 manifesto does not contain any reference to drug policy (although crime policies include scrapping the CPS and Human Rights Act). The UKIP media spokesperson informed Transform via Twitter that having a Royal Commission on drug policy is official policy. The Misuse of Drugs Act 1971 is out of date. It is failing to provide our young people with adequate protection both from illegal drugs and ‘legal highs’. It places a duty on the state to prove a drug is dangerous before it is banned, yet pharmaceutical companies have to prove drugs are safe before they can be sold. Allow Ministers to temporarily classify new drugs and drug groups until they are proven safe. Review the role of the advisory council on the misuse of drugs with a view to extending its powers and influence over education and health promotion. Devolve powers to Northern Ireland. Strengthen statutory support for drug prevention and rehabilitation schemes. The call for devolved drug policy is repeated later in the manifesto. At time of writing we were unable to find the 2010 Ulster Unionist manifesto. 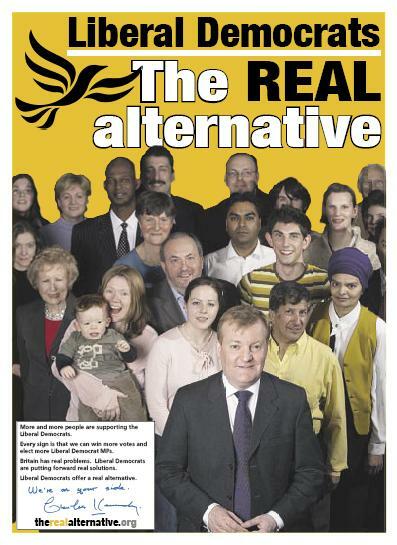 The 2005 manifesto contains no reference to drugs or drug policy (beyond a commitment to the ban on smoking in public places). Given the alliance with the Conservative party the assumption is that policy will be in line with Conservative commitments (this will be updated if not the case). "All ex-service personnel should be given comprehensive advice about mental health conditions and information on where assistance can be accessed promptly.More effective prevention and early intervention measures must be introduced to tackle mental health conditions and drug and alcohol abuse." "Other important priorities are domestic abuse, knife crime and alcohol and drug-related offences"
Criminals should be made to serve their full sentences, with time added for bad behaviour. The only way out of prison ‘early’ should be a maximum 20% reduction in return for a clear demonstration of the acquisition of genuinely useful skills, or full rehabilitation in the case of drug addicts, whereupon Parole Boards should have the power to release such model prisoners, tagged and under tight restrictions doing restorative work within the community. Given the role of drugs and addiction involved in so much crime, the present pitiful provision of a mere 2,500 drug rehabilitation places nationwide is a false economy, as well as a national shame. We would oversee a one hundred-fold increase in this figure, to be in place within six months of coming to office. Thestaff and money for this vital social service and anti-crime measure will be provided from cuts made in various of the parasitic and useless public sector jobs identified later in this Manifesto. Charity commission guidelines on strict neutrality in elections prevent us from saying what we think of the BNP. On drug policy specifically however, their positions on sentencing are not dissimilar to much mainstream tabloid punitive populism, and the call for more rehab also in line with most of the other parties, even if the 100 fold increase in provision (the Tories offered a mere 10-fold increase in 2005) gives the appearance of pure rhetorical invention rather than careful calculation. The death penalty call takes the punitive populist line to its extreme; needless to say there is no evidence from countries that actually use the death penalty that it is an effective deterrent, and it is also unambiguously illegal under both EU and International Law (withdrawal from the EU is BNP policy, but not from the UN). Copied below are the abstract and conclusion from paper published last week in the International Journal of Drug Policy, by Damon Barrett (Senior Human Right Analyst at IHRA), titled 'Security, development and human rights: Normative, legal and policy challenges for the international drug control system'. In this important and groundbreaking commentary Barrett outlines a series of theoretical and practical challenges for the international drug control system, reconceptualizing it within a broader human rights law analysis. Transform's Danny Kushlick (credited) was involved in developing the thinking behind the paper, and Transform's 'Blueprint for Regulation' is also cited along with our recent Impact Assessment briefing paper. This commentary addresses some of the challenges posed by the broader normative, legal and policy framework of the United Nations for the international drug control system. The ‘purposes and principles’ of the United Nations are presented and set against the threat based rhetoric of the drug control system and the negative consequences of that system. Some of the challenges posed by human rights law and norms to the international drug control system are also described, and the need for an impact assessment of the current system alongside alternative policy options is highlighted as a necessary consequence of these analyses. International drug control, as currently formulated, may be conceptualised as an ‘international risk environment’ for the related damage to security, development and human rights that has been documented worldwide. The human rights risk is particularly clear. The first step in addressing this is to begin to shift the debate at the international level away from threat based rhetoric and towards meeting the aims of the UN. Based on modern debates concerning human security and human development, this demands consideration of more locally and culturally appropriate responses that place individuals and communities at the centre of drug policies. An impact assessment of the current approach is necessary, set against alternative policy options that may achieve better results in terms of security, development and human rights. That call is supported by international human rights law. This assessment should have happened at the ten year review of international drug policy at the UN Commission on Narcotic Drugs (March, 2009). 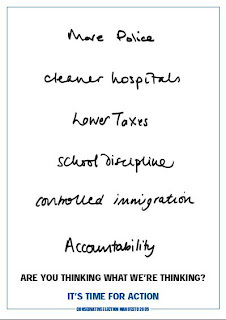 Instead, the same policies, with some minor amendments to language, though hard fought by some of the more progressive governments, were prescribed for the next ten years. Indeed, it may be argued that advocating for a move towards policy based on the aims of the UN naively presumes genuine governmental support for those aims, when in fact other political agendas are more likely the drivers of current drug control efforts. This is likely the case for some governments. But this does not stall the discussion. Indeed, it is one more argument for reframing the debate so that the UN system, within which international drug control resides, is not one behind which these agendas may hide (Barrett & Nowak, 2009). The Barrett and Nowak reference in the conclusion is for a book chapter titled 'The United Nations and Drug Policy: Towards a Human Rights Based Approach' (Nov 2009) that explores some of the themes in the IJDP paper in more detail. Highly recommended, it is also available in full here on the International Center for Human Rights and Drug Policy website (pdf). Barrett's co-author Manfred Nowak is the UNs Special Rapporteur on Torture. Steve Rolles, Senior Policy Analyst for Tranform. Please email events@25bedfordrow.com if you are interested in attending. 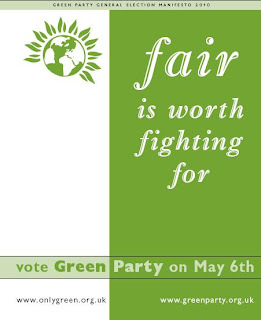 In the penultimate installment in our review of party election manifesto commitments on drug policy (see Labour, LibDems and Conservatives), today is the turn of the Green Party manifesto, published yesterday and titled 'fair is worth fighting for'. Simply making our society more equal will improve our health, without spending a penny extra on the NHS. Life expectancy, infant mortality, low birth-weight and self-rated health are worse in more unequal societies. Mental illness is much more common in more unequal countries. Drug addiction is more common in more unequal societies. Obesity is less of a problem in more equal societies like Japan and worst in the most unequal ones like the US. Better health is not a matter of ever-increasing spending on the NHS. A surer route, which can’t be disrupted by the need to bail out bankers, is to support simple things like good food, less competition and less stress." To deal with crime we have to address why it occurs and what to do when it does. 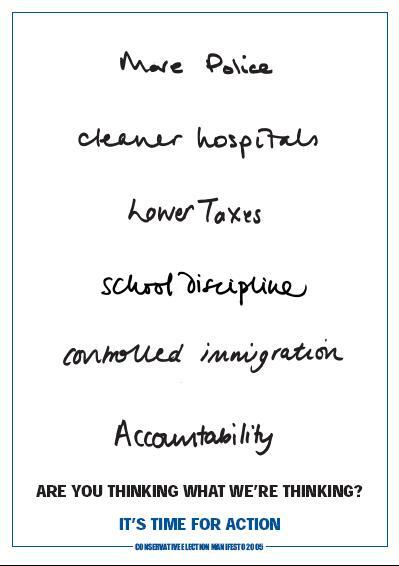 On the causes of crime we must first recognise that there is more crime in more unequal societies, and that by making our society more equal in the ways set out in this manifesto we will also make it safer. Second, we must act on the fact that over half of all crime is caused one way or another by misuse of Class A drugs, mainly heroin or crack cocaine. Radical reform of our drug laws will massively cut crime. Treat heroin and crack addiction as a health issue and not wait for them to become a crime problem. We would offer treatments that may include prescription of heroin thus removing the cause of most petty drug-related crime carried out by the addicts and removing the market from heroin dealers. Concentrate police and customs resources on the large-scale production, importation and marketing of these drugs. So there is a welcome recognition that drug use should be primarily a health issue, and that it is the criminalisation of drugs that causes the huge secondary harms to society in terms of huge amounts of property crime. The clear need for more radical reform of the drug laws is made very clear as is the support for heroin prescription as central to reducing prohibition harms. The last bullet point about focusing police and customs resources on Class A drug markets, suggests that they would not be focussed on other drugs, but, like the Lib Dems, is somewhat at odds with the rest of the analysis, essentially recommending a symptomatic response whilst ignoring the reality that prohibition is the primary cause of these markets. "The prohibition of drugs doesn’t work. It does not protect society in any way, and makes it more difficult to minimise the harm caused by drug use. Addicts are treated as criminals, rather than patients in need of treatment. Every year, tens of thousands of people are put through the criminal justice system, needlessly paralysing the resources of the police, courts, and prisons. Families are torn apart, and people are made jobless and homeless just because they are criminalised by outdated laws. Drug barons are profiting from prohibition and using that money to corrupt those individuals and institutions that should protect society". "Take the drug trade out of criminal control and place it within a regulated and controlled legal environment." The 2010 Manifesto call for a radical reform of our drug laws is welcome, but it is a shame that the Greens' long held commitments to legal regulation drugs is not made explicit. Like the Lib Dems there is a clear reticence to take debated and agreed intellectual positions to the people, rather undermining claims to be parties of political boldness and change. "Restitution for the victim and the community and rehabilitation of the offender are key ingredients of the Green approach to justice. While prison plays an important role in the criminal justice system, it should not be used as a way of simply holding people with long-term drug addiction, social and mental health problems." ...although, no details are given as to what this might entail in practical terms. So similar, but even less detail or engagement with the debate around regulation/prohibition. Good morning. I'm Ethan Nadelmann, executive director of the Drug Policy Alliance, the nation's leading organization advocating alternatives to the failed war on drugs. I want to thank the subcommittee for inviting me to testify on ONDCP's priorities and objectives. It is hard to talk in detail about ONDCP's overall strategy when their 2010 Strategy is not yet out, but there are certain things we know based on their proposed FY11 Budget Highlights and recent statements and remarks by Director Gil Kerlikowske and others. I want to highlight four issues -- ONDCP's flawed performance measures, the lop-sided ratio between supply and demand spending in their budget, the lack of innovation in their proposed strategies, and their failure to adequately evaluate drug policies. But first a little context is required. The predominant role that criminalization and the criminal justice system play in dealing with particular drugs and drug use in this country is unsustainable in both fiscal and human terms. Police made 1.7 million drug arrests in 2008 alone, including 750,000 for nothing more than possession of marijuana for personal use. Those arrested were separated from their loved ones, branded criminals, denied jobs, and in many cases prohibited from voting and accessing public assistance for life. The United States now ranks first in the world in per capita incarceration rates, with less than 5% of the world's population but nearly 25% of the world's prison population. Roughly 500,000 people are behind bars tonight for a drug law violation. That's ten times the total in 1980, and more than all of western Europe (with a much larger population) incarcerates for all offenses. More than half of federal prisoners are there for drug law violations; relatively few are kingpins and virtually none are queenpins. Yet, despite spending hundreds of billions of dollars and arresting millions of Americans, illegal drugs remain cheap, potent and widely available throughout the country and the harms associated with them continue to mount. Meanwhile, the war on drugs is creating problems of its own - broken families, racial disparities, and the erosion of civil liberties. Few government policies have failed for so long without any serious effort to question or revise them. U.S. Senator Jim Webb (D-VA) said recently, speaking about our country's uniquely high incarceration rate, "either we have the most evil people in the world or we are doing something wrong with the way we approach the issue of criminal justice." He went on to say "the central role of drug policy in filling our nation's prisons makes clear that our approach to curbing illegal drug use is broken." Unfortunately, ONDCP seems unwilling to reassess this role in any meaningful way. When it comes to performance measures, ONDCP historically has pointed to increases or decreases in the total number of Americans who admit to using an illegal drug within the last year as the most important criteria for judging the success or failure of U.S. drug policy. The agency sets two- and five-year goals based on annual surveys of drug use. It is not evident yet what performance measures ONDCP will lay out in its forthcoming Strategy, but when speaking before the 53rd UN Commission on Narcotic Drugs last month Director Kerlikowske said, "[t]he U.S. Strategy will emphasize and focus on our commitment to reduce U.S. drug consumption." Drug use rates tell us surprisingly little, however, about our nation's progress toward reducing the actual harms associated with drugs. If the number of Americans using illegal drugs decreases, but overdose fatalities, new HIV/AIDS infections, racial disparities and addiction increases, the Drug Policy Alliance would consider that failure. In contrast, if the number of Americans using illegal drugs increases, but overdose fatalities, new HIV/AIDS infections, racial disparities and addiction declines, the Drug Policy Alliance would consider that success. Key performance measurements should focus on the death, disease, crime and suffering associated with both drugs and our drug policies, not drug use per se. Simply stated, ups and downs in how many people say they used marijuana or other drugs last year are far less important than ups and downs in drug overdose fatalities, or new HIV and hepatitis C infections, or expenditures on incarceration of non-violent drug offenders. If this subcommittee advances only one drug-related reform it should be to require ONDCP to set objectives for reducing the harms associated with both drugs and the war on drugs. ONDCP shouldn't just set short- and long-term goals for reducing drug use; it should set specific goals for reducing fatal overdoses, the spread of HIV/AIDS and hepatitis C, racial disparities, the number of nonviolent offenders behind bars, and other negative consequences of both drug use and drug control policies. Ideally, ONDCP will use their 2010 Strategy as an opportunity to set a new bottom line in U.S. drug policy, but if they fail to do so Congress should set it for them. The U.S. Conference of Mayors, the National Black Caucus of State Legislators, and the National Latino Congreso have all called for setting new performance measures in U.S. drug policy that focus on reducing both drug- and drug-war-related problems. In terms of the broad strokes of ONDCP's proposed FY11 drug war budget, it is largely a continuation of the failed drug policies of the last three decades, with most of the money dedicated to ineffective supply-side programs, relatively little going to treatment and prevention, and almost none going to harm reduction. Director Kerlikowske told the Wall Street Journal last year that he doesn't like to use the term "war on drugs" because "[w]e're not at war with people in this country." Yet 64% of their budget - virtually the same as under the Bush Administration - focuses on largely futile interdiction efforts as well as arresting, prosecuting and incarcerating extraordinary numbers of people. Only 36% is earmarked for demand reduction - and even that proportion is inflated because the ONDCP "budget" no longer includes costs such as the $2 billion expended annually to incarcerate people who violate federal drug laws. The U.S. is never going to significantly reduce the problems associated with drug use and misuse as long as most of the drug war budget is dedicated to supply reduction instead of demand and harm reduction. 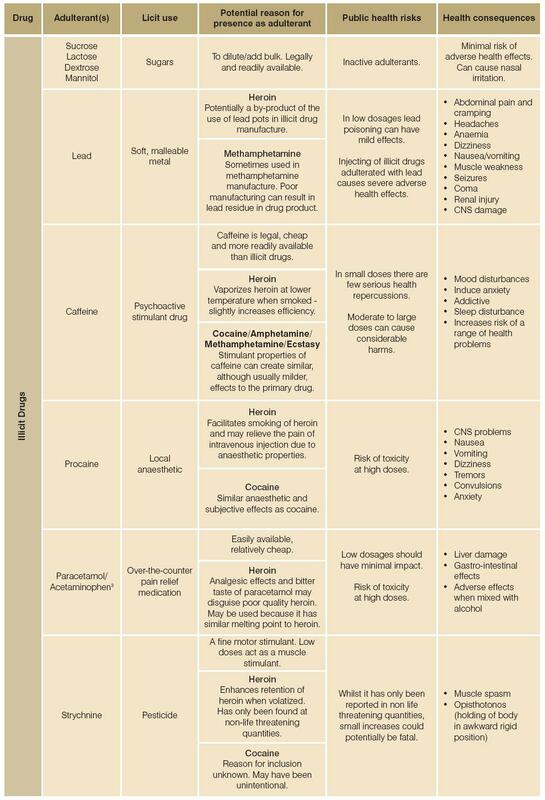 Drug strategies that seek to interrupt the supply at its source have failed over and over again for cocaine, heroin, marijuana and virtually every drug to which they have been applied - including alcohol during alcohol Prohibition. The global markets in marijuana, coca, and opium products operate essentially the same way that other global commodity markets do: if one source is compromised due to bad weather, rising production costs, or political difficulties, another emerges. In contrast, experts have known for years that increasing funding for treatment is the most cost-effective way to undermine illicit drug markets and reduce substance misuse. A 1994 RAND study commissioned by the U.S. Army and ONDCP found treatment to be 10 times more effective at reducing drug abuse than drug interdiction, 15 times more effective than domestic law enforcement, and 23 times more effective than trying to eradicate drugs at their source. A 1997 SAMHSA study found that treatment reduces drug selling by 78%, shoplifting by almost 82% and assaults by 78%. More recent studies have reached similar conclusions. In 2000, voters in California approved the Substance Abuse and Crime Prevention Act - also known as Proposition 36 - which had been drafted and sponsored by the Drug Policy Alliance and allied organizations. That initiative requires the state to provide drug treatment, rather than jail, for nonviolent drug possession offenders. It also doubled previous annual state funding for drug treatment. A recent evaluation by UCLA found that California taxpayers saved nearly $2.50 for every dollar invested in the program. Of people who successfully completed their drug treatment, California taxpayers saved nearly $4 for each dollar spent. In all, Proposition 36 is estimated to have saved the state government and localities roughly $2 billion dollars. The problems with ONDCP's FY11 proposed drug budget involve more, however, than the bias in spending in favor of supply reduction. Most of the programs being funded are not all that different than those funded by previous administrations, yet the Bush Administration's assessment of roughly half of federal drug war programs found just one that could be rated moderately effectively, a few were rated adequate, and most were rated ineffective or results not demonstrated. Not one was rated truly effective. The solution thus involves more than re-balancing the proportion of funds spent on supply vs. demand reduction. Drug education and prevention may be underfunded, but existing expenditures are also poorly spent. The federal government continues to waste tens of millions of dollars each year on D.A.R.E., the National Youth Anti-Drug Media Campaign, student drug testing and other scared-based prevention programs repeatedly proven to be ineffective. More funding for treatment is needed but those expenditures will prove most beneficial if they are no longer inappropriately circumscribed by drug war politics and ideology. Most indications suggest that ONDCP is unlikely to propose any new initiatives that differ in significant ways from those of preceding administrations - although there are some modest steps in the right direction such as requesting funding to train physicians to identify and respond to substance misuse in their patients and better coordinating treatment and prevention services. ONDCP is requesting needed money for the Second Chance Act and other programs designed to reduce recidivism and help offenders reintegrate into society, but the prison door will remain a revolving door as long as police make 1.7 million drugs arrests each year. Reintegration will also be difficult so long as federal and state laws prohibit formerly incarcerated individuals from accessing public housing, student loans, and other public assistance. Director Kerlikowske has said in several recent speeches that U.S. drug policy should be "evidence-based" and "balanced" but there is little reason to believe that ONDCP's 2010 Strategy will be either. U.S., foreign and international agencies that focus on preventing HIV/AIDS domestically and internationally routinely rely on harm reduction interventions and employ the language of harm reduction. Deputy ONDCP director Tom McLellan appeared to break new ground in 2009 when he stated that "we support all harm reduction efforts that also reduce drug use." But that acknowledgement of the important role of harm reduction in drug policy was repudiated last month when Director Kerlikowske declared that "we do not use the phrase 'harm reduction' to describe our policies because we believe it creates unnecessary confusion and is too often misused to further policies and ideologies which promote drug use." Dozens of foreign governments that employ harm reduction language and policies reportedly found the statement foolish, although they welcomed the United States' belated support of needle exchange and other science-based policies. Congress's recent repeal of the ban on federal funding for sterile syringes to reduce HIV represented an important step forward in elevating science over politics. It is a shame that ONDCP appears to have played little to no role in accomplishing that important reform and has yet to articulate a plan for working with states to improve syringe availability to reduce the spread of HIV/AIDS and hepatitis C. Their FY11 Budget Highlight contains no dedicated funding for syringe exchange. This is a missed opportunity to create a continuum of care linking syringe exchange and other harm reduction programs with treatment and rehabilitative programs in ways that blur the boundaries among programs and truly focus on helping people manage or even stop their dependence on illicit drugs. Director Kerlikowske has spoken eloquently and forcefully in support of reducing fatal drug overdoses from legal and illegal opiates. ONDCP, however, has yet to demonstrate any leadership in advancing the most effective (and cost-effective) means of reducing fatal ODs - increasing access to the overdose antidote, naloxone. Dedicated funding appears to be absent from their Budget Highlight and there is no indication it will be part of their Strategy. Thousands of lives a year could be saved if ONDCP prioritized this intervention. Fatal drug overdoses increased more than 400 percent between 1980 and 1999 and more than doubled over the last decade. Overdose is now the second leading cause of accidental death (second only to automobile crashes) and the leading cause of accidental death in 16 states and among Americans aged 35 to 54. More Americans died last year from drug overdoses than firearms. Naloxone is a highly effective opioid antagonist that rapidly reverses an overdose when administered by a peer or medical professional. Participants in overdose prevention programs are trained how to administer naloxone, perform CPR, initiate rescue breathing and put a victim in the recovery position until emergency help arrives. Naloxone distribution programs are commonplace abroad and can also be found in a growing number of U.S. cities including Baltimore, Chicago, Los Angeles, Philadelphia, New York City and San Francisco; New Mexico and Massachusetts have statewide programs. Many more would be available if federal funding were available. ONDCP has also dismissed two other highly successful, evidence-based harm reduction strategies - supervised injection facilities and heroin assistance treatment. Their FY11 budget contains no funding for even trial or research programs on them, notwithstanding abundant evidence that they have succeeded in a diversity of foreign locations. An estimated 90 supervised injection facilities currently operate in forty cities around the world. To date, 28 methodologically rigorous studies on the impact of supervised injection facilities have been published in leading peer-reviewed medical journals. These studies demonstrate that supervised injection sites are associated with reductions in overdose fatalities, syringe sharing, public injecting, and publicly discarded syringes, increased uptake of drug detoxification and addiction treatment programs, and no increases in drug-related crime or rates of relapse among former drug users. There is but a single supervised injection facility in North America - Vancouver's Insite program. Director Kerlikowske visited that program during his tenure as Seattle police chief and wrote a brief but straight-forward memo on it for his command staff. Public health officials in San Francisco and other U.S. cities have considered establishing pilot supervised injection sites in the U.S., but are wary of attempting to proceed in the face of federal opposition. The mixture of arrogance and fear with which ONDCP officials dismiss even the possibility of supporting research in the area is sadly reminiscent of past ONDCP opposition to syringe exchange programs notwithstanding the scientific consensus in their favor. Their opposition provides a powerful reminder that President Obama's mandate that politics no longer trump science does not extend to federal drug policy. Evidence in support of heroin assisted treatment is equally strong. These programs enable people addicted to street heroin who have not succeeded in other treatment programs to be prescribed pharmaceutical heroin as part of a broader treatment regimen. Heroin assisted trials have now been conducted in six countries - Switzerland, the Netherlands, England, Spain, Germany, and Canada. Denmark recently decided to skip pilot projects and go straight to offering heroin assisted treatment for those who need it because the evidence from elsewhere was so conclusive. Peer-reviewed studies around the world have concluded that heroin assisted treatment is associated with reductions in crime, overdose fatalities, risky behavior and other problems as well as improvements in physical and mental health, employment and social relations. Cost-benefit studies demonstrate that the relatively high cost of heroin-assisted treatment is more than covered by reductions in criminal justice and health care costs. Some of these results were reported in an evaluation of the Canadian research trial (known as NAOMI - the North American Opiate Medication Initiation) published in the distinguished New England Journal of Medicine. By contrast, few reports can be found in refereed scientific journals demonstrating any significant failures or harmful consequences of heroin assisted treatment. T"he potential for gain...is substantial. Even in the aging heroin-addict population, there are many who are heavily involved in crime and return frequently to the criminal justice system. Their continued involvement in street markets imposes a large burden on the community in the form of civil disorder that helps keep investment and jobs out. If heroin maintenance could remove 10 percent of Baltimore's most troubled heroin addicts from the streets, the result could be substantial reductions in crime and various other problems that greatly trouble the city. That is enough to make a debate on the matter worthwhile." The same could well be said of dozens of other U.S. cities where heroin is used illegally by significant numbers of residents. For those who hesitate to allow the legal prescription of heroin, it is worth pointing out that two research trials found that longtime users of heroin could not distinguish it, in controlled double blind studies, from hydromorphone (more commonly known by its trade name, Dilaudid), which is widely used in pain management both here and abroad. During his speech at the UN Commission on Narcotics Drugs, Director Kerlikowske told representatives from other nations that "We [the U.S. government] support evaluating individual programs and policies on their own merit, not on whether they do or do not fall under any particular ideological label." Yet ONDCP's persistent refusal to support even trying what has worked so well in every foreign research trial cannot help but call into question its commitment to science over ideology. Finally, ONDCP's request for $15.5 billion in drug war expenditures for FY11 includes virtually no allocation for rigorous assessment of the efficacy of U.S. drug policies. This continues a long ONDCP tradition of spending enormous amounts of taxpayer money on demonstrably failed policies without examining alternatives. Even a modest allocation to commission the National Academy of Sciences (or a similarly objective, non-politicized entity) to assess alternative drug policies both here and abroad would represent an important breakthrough in holding U.S. drug policies accountable to more objective evidence-based criteria. So would a requirement that federal agencies involved in the drug war devote a portion of their budgets to evaluating the efficacy and unintended consequences of their policies and programs. Congress and the Obama administration have broken with the costly and failed drug war strategies of the past in some important ways - by allowing federal funding of syringe exchange to reduce HIV, by allowing state governments greater latitude to regulate the availability of marijuana for medical purposes, by moving forward on reducing racially discriminatory crack/powder mandatory minimum sentences, and by working more diligently to integrate effective drug treatment into ordinary medical care. But the continuing emphasis on interdiction and law enforcement in the federal drug war budget, the persistent preference for typically futile supply reduction initiatives over demand and harm reduction efforts, the refusal to jettison federal programs that show no signs of success, the arrogant rejection of harm reduction initiatives that have proven successful abroad, and the absence of any commitment to rigorous evaluation of current policies and alternative options - all suggest that ONDCP's plans for the future are far more wedded to the failures of the past than to any new vision for the future. I urge this committee to hold ONDCP and federal drug policy accountable to a new set of criteria that focuses on reductions in the death, disease, crime and suffering associated with both drugs and drug prohibition. "Ensure that financial resources, and police and court time, are not wasted on the unnecessary prosecution and imprisonment of drug users and addicts; the focus instead should be on getting addicts the treatment they need. Police should concentrate their efforts on organised drug pushers and gangs." "Always base drugs policy on independent scientific advice, including making the Advisory Council on the Misuse of Drugs completely independent of government." "Move offenders who are drug addicts or mentally ill into more appropriate secure accommodation." This is essentially all there is, excepting a mention of being 'critical supporters of the Afghan Mission' in the 'Your World' chapter. Drugs, however, are are not specifically mentioned, the stated aim only being to 'stabilise Afghanistan enough to allow British troops to come home during the next Parliament'. The tone of the Lib Dems drug policy (and criminal justice policy more generally) is notably different from that of the other two main parties, with a seemingly more upfront commitment to evidence over punitive populism. The exception is the above reference to "pushers" which is rather old-school fear mongering language, and a term notably not used to describe those who aggressively market alcohol or tobacco. "Safeguard academic freedom and the independence of scientific advisers by amending the Ministerial Code to prevent government from bullying or mistreating advisers and distorting evidence or statistics. " 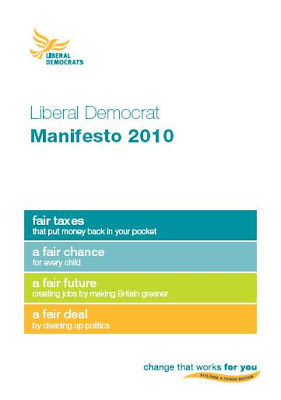 The 2010 commitments offer marginally more detail than the Lib Dems 2005 manifesto , which was also far more concise overall. "We will concentrate more police efforts on tackling drug traffickers and those drug users who resort to crime to feed their habits, rather than criminalising people possessing cannabis only for their own personal use." "We will increase police resources to improve the detection and investigation of crime. We will create a co-ordinated UK BorderForce to strengthen the country’s borders against terrorism, people trafficking and drug smuggling." The most obvious change between 2005 and 2010 is the dropping of any direct mention of cannabis, presumably reflecting the minefield that issue become in the intervening years, although the 2010 commitments regarding the ACMD are arguably at least an indirect nod to cannabis policy. What you do not learn from either manifestos is that the Lib Dems do in fact have a more detailed official drug policy document, that was developed in 2002, titled Honesty, Realism, Responsibility: Proposals for the Reform of Drugs Law that is - from Transform's perspective - far more pragmatic and forward looking than anything to emerge from the other two major parties. It contains a strong critique of prohibition generally, and openly explores ideas for decriminalisation of personal drug possession, and legal regulated cannabis supply, albeit caveated with the need for UN convention reform as a precondition. They are unique amongst the three main parties in having engaged with these ideas. Whilst the Lib Dems appear to have made the intellectual journey on drug policy reform, they have still shied away from it when it comes to front line politics. For them it remains an issue on which they have generally been defensive, (choosing to avoid - sometimes even deny) rather than one they actively campaign on. 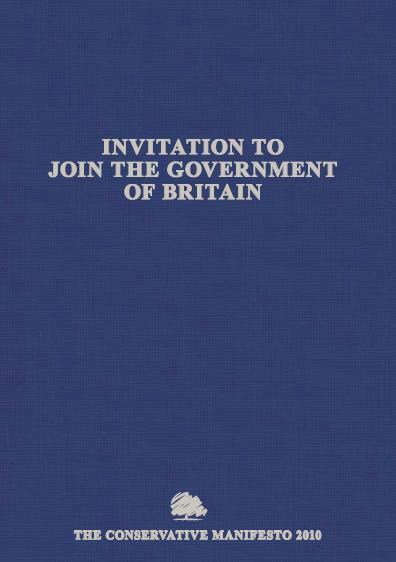 Continuing with our coverage of election party manifesto commitments on drug policy (see Labour's here), today the new Conservative 2010 manifesto is published, titled 'Invitation to Join the Government of Britain'. "We will stop central government funding for new fixed speed cameras, and switch to more effective ways to make our roads safer, including authorising ‘drugalyser’ technology for use in testing for drug-driving. " This is interesting reflection on evidence based policy making in as much as it proposes reigning in speed cameras, a proven technology, at the same time as rolling out an unproven one, 'drugalysers', in the same sentence. 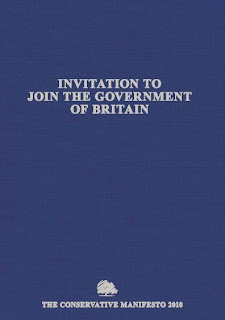 The main drug policy content has to wait until the 'Change society' chapter, unsurprisingly perhaps, under the 'Fight back against crime' subsection (again there is nothing in the health sections) which explores the Tory themes of mending 'Broken Britain', with the main focus on a crack down on binge drinking, and various calls for tougher alcohol regulation. "A Conservative government will help to mend our broken society – by cracking down on drink- and drug-fuelled violence, tackling re-offending, and intervening early to stop young people getting onto the conveyor belt to crime – in order to reduce the causes of crime and anti-social behaviour." Extremists, serious criminals and others find our borders far too easy to penetrate. That is why we will create a dedicated Border Police Force, as part of a refocused Serious Organised Crime Agency, to enhance national security, improve immigration controls, and crack down on the trafficking of people, weapons and drugs. We will work with police forces to strengthen arrangements to deal with serious crime and other cross-boundary policing challenges, and extend collaboration between forces to deliver better value for money. At the moment, many prisoners leave jail and lapse back into a life of drink, drugs and re-offending. We will never bring our crime rate down or start to reduce the costs of crime until we properly rehabilitate ex-prisoners. So, with a Conservative government, when offenders leave prison, they will be trained and rehabilitated by private and voluntary sector providers, under supervision. We will use the same approach that lies behind our welfare reform plans – payment by results – to cut re-offending, with organisations paid using savings made in the criminal justice system from the resulting lower levels of crime. Drug and alcohol addiction are behind many of the crimes that are committed on our streets, but the treatment that too many addicts receive just maintains their habits. We will give courts the power to use abstinence-based Drug Rehabilitation Orders to help offenders kick drugs once and for all. We will introduce a system of temporary bans on new ‘legal highs’ while health issues are considered by independent experts. pilot a scheme to create Prison and Rehabilitation Trusts so that just one organisation is responsible for helping to stop a criminal re-offending. There is obviously a bit more to consider than the Labour's paltry 55 word offering, but there are no surprises and, in reality very little to distinguish it from Labour's existing drug strategy. There are some minor (and largely unexplained) tweaks to the way services are to be funded and a bit of rhetorical window dressing. The irony presumably lost on the Conservatives, is that they demand 'payment by results' for those providing services to reduce offending, whilst failing to take the same medicine themselves by assessing the value for money of prohibition - which creates most the offending in the first place. Again we will leave you to make your minds up on the merits or otherwise of what's on offer. In contrast to Labour, the Conservative manifesto in 2005 had considerably less content on drug policy than in 2010, but the 2005 manifesto was generally more concise deploying lots of populist soundbites and almost no detail. We will break the link between drugs and crime by massively expanding treatment programmes, including 25,000 residential rehab places (compared with fewer than 2,500 places today), and by giving all young users of hard drugs a straight choice – effective treatment or appearing in court. We will stop sending mixed messages on drugs by reversing Labour’s reclassification of cannabis as a less serious drug, changing it from class ‘C’ back to class ‘B’. We will support the social institutions – families, schools, voluntary bodies and youth clubs – that can prevent crime and drug dependency before it starts. The specific 2005 commitment to increase residential rehab 10 fold has now gone, although the emphasis on rehab remains (interestingly 'residential' rehab is not mentioned specifically, perhaps now the cost implications have sunk in), and we see the abstinence rhetoric, that Labour have also led with (two mentions of 'drug-fee lives' in 55 words), also appearing more explicitly. The only other real 2005 commitment, to reclassify cannabis back to B, has gone as that has obviously happened anyway.